Fashion catalogue offering pay monthly credit terms ideal for Women sized 14-32. Find the latest Styles and Fashion labels and spread the cost. The Curvissa Catalogue with Credit believe Plus size fashion shouldn’t be about compromise, it should be about choice. 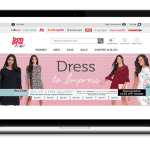 Curvissa.co.uk offers a selection of over 3,000 quality fashion items in sizes 14 – 32, giving you a comprehensive collection of plus size clothing that includes everything from trousers and tops, to jackets and jeans. Apply today for an instant decision and spread the cost with easy monthly repayments.